Members of the sect that Assad belongs to think the rebels and their Sunni allies are nothing but trouble. ANTAKYA, Turkey -- It was September 10, the start of another sweltering, violent day in Antakya, a Turkish town just twelve miles from the Syrian border. In Armutlu, an Arab Alawite neighborhood in the city’s southwest, the previous night’s burnt barricades were still smoldering, new ones were going up, riot police and residents were bracing for yet more street battles, and Ahmet Atakan, a 22-year-old man, was dead. 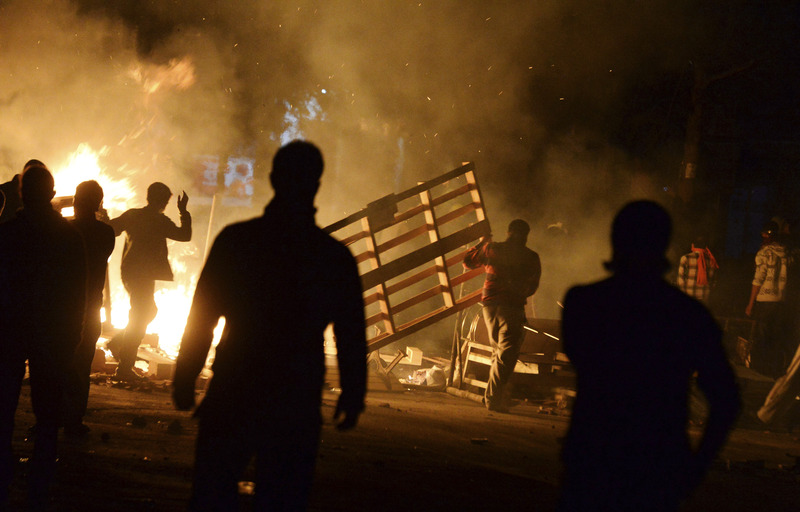 The cause of Atakan’s death, which occurred during nighttime clashes between anti-government protesters and police, was already being hotly debated. Locals insisted Atakan had been killed by a tear gas canister fired at close range. The authorities, citing police reports, said he fell off a rooftop. A video released some time later appeared to corroborate their version of events. A detailed investigation is ongoing. On Gunduz Avenue, the heart of Armutlu, locals gathered at the spot where Atakan’s body was found, placing flowers and Turkish flags near what appeared to be a small puddle of blood. Anti-government graffiti covered the nearby walls, echoing, like the previous night’s protests themselves, the unrest that shook Turkey earlier this summer. “Çarşı,” read one tag, honoring the diehard fans of a soccer club, Beşiktaş, who had led many of the June demonstrations and riots in Istanbul. “Everywhere is Taksim, everywhere is struggle,” read another. A hundred yards or so down the street, someone had painted a large mural of a local man, Abdullah Cömert, killed nearby during one of the June protests. “You won’t be forgotten,” said the writing beneath it. In Istanbul and Ankara, protests against Turkey’s increasingly authoritarian yet enduringly popular Prime Minister, Recep Tayyip Erdoğan, though much smaller than earlier, have become an almost weekly occurrence since June. But in Antakya, home to a large Arab Alawite minority to which both Cömert and Atakan belonged, they have also acquired a palpably sectarian tint. Turkey’s Alawites, most of them concentrated in and around Antakya, are said to number up to one million. Though ethnically Arab, many consider themselves part of the much bigger family of Turkish Alevis, a community of anywhere from 12 to 20 million. A large majority of Turks, including Sunnis, oppose any outside intervention in Syria, but anti-war and pro-Syria sentiment is particularly pronounced among Alawites, whose ethnic kinsmen, including President Bashar al Assad, form the core of Syria’s ruling elite. On the outskirts of town, a crowd of several thousand people gathered at the cemetery where Atakan was being buried. A local imam recited prayers over the young man’s grave. Gusts of wind picked up the dust from the surrounding olive groves and blew it into the mourners’ eyes. The sun beat down hard and relentlessly. A group of older women and men took cover beneath a large aluminum awning. As the funeral service drew to a close, and as the crowds began to march back towards Armutlu, I ran into a portly young man wielding a loudspeaker, a small photograph of Atakan affixed to his blue polo shirt. His name was Mehmet Karasu, he said, and he was the head of the Antakya Solidarity Committee, a group that had formed in late May to support the Gezi protests in Istanbul. Karasu and his group, including Atakan, had been staging sit-ins on Gunduz Avenue each Monday, demanding justice for the families of Abdullah Cömert and four other anti-government protesters killed across Turkey since May. The night of Atakan’s death, Karasu said, they had also been demonstrating against a police crackdown on students in Ankara. What seemed to weigh on their minds today, however, was Syria. Çapar and others appeared to retain a soft spot for the Syrian regime. “Bashar doesn’t kill people, they are the ones killing people, the jihadists,” she said. A young man, Mehmet Dağ, chimed in. “Before the war, everyone was living comfortably in Syria. Then the Americans came, along with the Turks, with their so-called Middle East democracy projects, and made war,” he said. “I used to go to Syria all the time. The kind of democracy they had there, you could hardly find in most other places. To many Alevis and Alawites, Erdoğan’s newfound hostility towards Syria’s ruling regime, combined with its indulgence of Sunni extremists fighting Assad, is yet more evidence of the AKP’s alleged desire to foist a sectarian, Sunni agenda upon the whole Middle East, beginning with Turkey itself. Although Erdoğan’s government has acknowledged past wrongs, including a 1937-38 massacre of rebellious Alevis by government troops, reached out to community leaders, and plans to unveil a "democratization package" to address some of their main concerns later this month, many Alevis argue that this is mere window dressing, and that they remain second-class citizens. According to a July poll, as many as 87 percent believe they face discrimination. To this day, they point out, the state refuses to recognize their gathering places, cemevis, as places of worship on equal footing with mosques and gives their children no choice but to attend mandatory religion -- Sunni Islam -- classes in public schools. In Antakya itself, accusations abound that the AKP has resorted to gerrymandering in order to split the city along sectarian and ethnic lines. In Armutlu, evidence that Turkey’s role in Syria was fueling a new wave of Alawite resentment towards Erdoğan’s government was everywhere. On my way back from Atakan’s funeral, and en route to a protest that would end with yet more clashes with police, tear gas, burning barricades and even reports of gunshots, I stopped at a teahouse on the edge of the neighborhood. One of the local men, on recognizing a foreigner, asked me where I was from. Poland, I answered. “You look Al Qaeda,” he said, deadpan. (The cargo pants must have been a clear giveaway.) “That's because I'm Polish Al Qaeda,” I explained, winking. “I see,” he said. I looked for some trace of a smile on his face. There was none. “Leave while you can,” a younger man sitting next to him yelled. “War’s coming.” At least he, to judge by a good-natured grin and a subsequent invitation to tea, appeared to be joking. But only to some extent. The man, Aytaç Bağcı, a sports instructor, was convinced that the U.S. would attack Syria at any moment, and that this would play right into Erdoğan’s hands. “Every day they’re sending Islamist terrorists across the border,” he said, referring to reports that extremist groups were transiting Turkey en route to Syria. He and his friends had had enough of seeing bearded foreigners on the streets of Antakya, Bağcı said. “Wherever they go, people die,” he said. The chemical weapons attack in Ghouta, he was persuaded, had been staged by the rebels, not Syrian regime forces, in order to goad the U.S. into military action against Assad.